These handles are the best you will ever use. They will never loose their grip on the rasp and will last literally for years. They were designed to enhance comfort by covering the sharp corners of the rasp and fit in the palm of the hand. 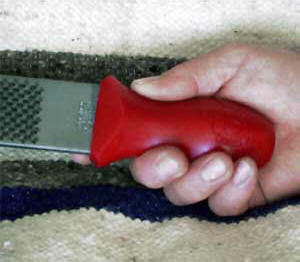 The polyurethane gives a cushion to the grip like no other and improves control while rasping. We offer mixed colors of which one will be chosen at random.